There’s no monkeying around when it comes to the health benefits that bananas offer. 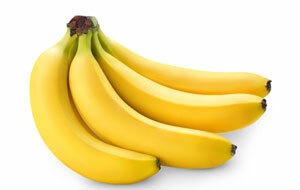 They’re rich in potassium (an essential mineral that helps maintain heart function and normal blood pressure), and they’re a very good source of vitamin B6 and a good source of fiber, manganese, and vitamin C. The potassium found in bananas may help promote bone health, and one study published in the Archives of Internal Medicine confirms that eating high fiber foods, like bananas, helps prevent heart disease. With its creamy flesh and delightfully sweet taste, it’s no wonder that the banana is one of the most popular fruits in the world! Whether you enjoy eating a banana as is, for snaking, or you like to incorporate bananas into dishes and drinks, this nutritious fruit is a superstar full of healthful benefits. For a tasty treat, try this: Line a baking sheet with parchment paper. In a small bowl, mix together yogurt and a little bit of cinnamon. Peel two bananas. Cut off one end from each banana, and then insert a popsicle stick into the cut end of each banana. Coat the banana popsicles with yogurt, and then roll in chopped almonds. Place bananas on baking sheet; freeze for 45 minutes. Enjoy!